Thanks for the great service provided and the excellent guides. 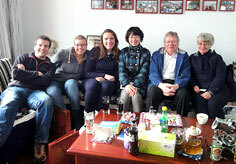 Both Tina (Beijing) and Joe (Shanghai) were wonderful and very very helpful. Below we've given more details. 1. Meals: The meals in general were good. It was a little hard to judge whether the secluded rooms in which we had our meals and/or the quality of service (friendliness of staff/flexibility of meal items) provided by the restaurants are typical to Chinese dining or related to tour-accomodating restaurants, but it took a little getting used to. I think in general that the quantity of food was very good, sometimes a little too much. 1) Both guides (Tina and Joe) were very very helpful, always considerate to our specific needs and even went out of their way to help us when we needed it. Tina made sure that our 4-year old son Alex was accommodated in hotels with his own bed and Joe helped me translate a cold medicine I needed to Chinese and helped buying tickets and getting on the train to Ningbo. They were also both very good at adjusting the amount of attractions we would see, because of time constraints when we needed to take it easier due to our son (hot chocolate rests and a slower walking pace). 2) Both Tina and Joe's English were outstanding and on the occasional mispronunciation they were very eager to accept corrections, although these were very few. I even had fun with Tina practicing my Japanese and German. She was very funny. 3) Joe and Tina both showed an exceptional flexibility in knowledge ranging from the practiced historical and cultural explanations of sights and places to teaching me how to pronounce words in Mandarin and explaining mythological and spiritual contexts of various statues, symbols and signs. More importantly they both knew when not to tell too much as it could have been easy to overwhelm us with information that then would have just become too much to remember anyway. A right balance I would say. 3. Cars: The cars were very clean and we enjoyed the friendly attitude of the drivers. Both were always helpful in helping our son (or ourselves for that matter) get in and out of the van. Our driver in Beijing was even so concerned about our son staying warm he went out of his way to help us buy clothes to keep him warm. A really good initiative rarely seen in tour personnel (in my experience). They both made sure the van was nice and warm so we could warm up quickly after being out in the cold and they both drove very safely yet quickly to get to the next place in time. I was impressed! As stated above we were very impressed with all people involved with TCG Tours. Our guides were very professional and friendly to a point where I consider them friends. The drivers were very good and went above and beyond their regular duties to make us comfortable and let's not forget both of you, Miss Tina Wang and Maggie Ye, who have so very very good in providing the right information and quick responses to our own queries, which is always important to reassure visitors that they are being taken well care of. Thank you so very much! I've sent a couple of pictures along, but would prefer not to have our e-mail address published. Thank you! Dear Abbey, We were thrilled with the arrangements that you made for our family while visiting Beijing and the surrounding area. I think my favorite meal was the Peking duck dinner followed by the Opera. What a great night of food and entertainment that was. Both our guide Cindy and our driver Mr. Lee and his 7 passenger Mercedes Van were wonderful. They were very prompt, very accommodating and very thoughtful. Cindy even arranged a birthday cake at dinner for my brother's birthday. We had asked for one "free" day on our own and my wife Jeanine had such a nice relationship with Cindy that they went shopping together that afternoon. The driver was very professional and safe. We felt right at home with Mr. Lee. He even made a special trip to take one of our group back to the hotel when they did not feel well and then picked him up later for dinner. The Crowne Plaza was an excellent and very comfortable hotel. All the food, all the various sights that we were taken to we great! We really enjoyed our stay. We have now returned to NZ, and reflect on our fond memories of your country. We are happy for our names and email address to be published by TCG. Should you require higher resolution pictures for any of the above please let me know. Our overall experience of TCG is: "more than exceeded our expectation, easy and safe way to journey, outstanding food, excellent accomadation, have seen all the main attractions and were well informed about the culture, history and lifestyle by outstanding guides"
In general we were in a small group of 5 which reduced to 3 in Guilin. we all got on very well and had very similar tastes in food and sites to visits: the time spend to some extent was managed by us as we were such a small group we could move on when we were ready. The guides all recognised this and so it work very well. The one meal that was average was on the boat on the Li Jiang river, however we were aware from your briefing notes and so it did not worry us. Outstanding meals there were many - the best meal was kept to last - central hotel in Shanghai fabulous!!!!. Without exception the guides all made a real effort to ensure that we were safe, well informed, kept warm and on time for all the times for the schedule that we had to met. The finishing touch that was so helpful was checking us in at the airports and making sure we made the departure gate - absolutely hassle free. The drivers were all fine and we understood that they didn't speak English. 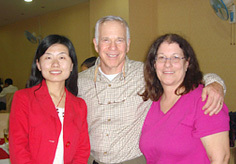 Angela in Guilin showed huge compassion to fellow citzens which we felt was very admirable. She also suggested that we go to the show in Yangshuo - this was outstanding and is certainly one of our highlights of China - we would suggest that you show this as an option for all future tours going to Yangshuo. The hotel in Yangshuo was a bit average but was worth the discomfort to see the show. In Bejing we would suggest that you also include a visit to the Birds Nest (Olympic games venue) we visited in our own time and it was great. All the guides spoke exceptional English and had very good manners. We stayed on in Shanghai at the end of the tour and Yi your guide in Shanghai arranged at our request a taylor who was fantastic and recommended a number of restuarants that proved to be excellent. Thank you for your request for feedback on our journey to your country. 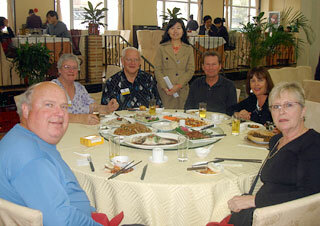 Meals - were excellent and the recommendations demonstrated extensive local knowledge. Guides - were conscientious with very good language skills and local knowledge. Cars - were very clean and the drivers were very competent and demonstrated great skill. Compliments - I would like to compliment in particular our guides, “Rose” in Beijing, “Tracy” in Xian and “Peter” in Lanzhou for exceeding that which could be normally expected from any guide. Their dedication to making our travels a wonderful experience cannot be adequately expressed. Also I would like to acknowledge to great work done behind the scenes by our travel consultants Kina Lu and Flora Cu. Without their expert knowledge and organizational skills our travels could not have progressed as effortlessly as it did. A great job all - round. One which Travel China Guide should be very proud of. 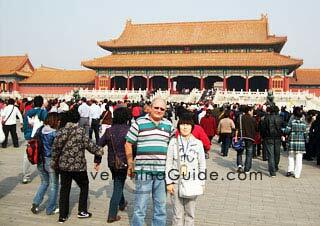 I have attached a photo of our guide “Rose” and myself in Beijing. Please feel free to use this feedback as you see fit and also please note that I have no hesitation to use / recommend your services. My wife Janet and I would like to compliment you and all of our guides and drivers on our recent journey to your country. Our guides, Brian, Annie, Peter, Anna and Julia were all wonderful. I cannot imagine any experience that would have been any better or more enjoyable for our purposes. We were members of a group of six travelling together and all of us enjoyed visiting your country. You must be very proud of the very professional and organized itineraries you provide and of your wonderful country. We will recommend you to any friends and fellow travellers whenever possible. 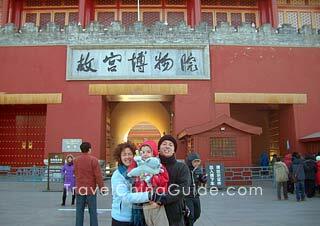 We first approached your travel company based on the very high praise given by a couple from Texas who had travelled with Travelchinaguide (we met them on a cruise). They were correct in everything they told us. The food choices were well thought out and reflected a good balance between regional Chinese dishes and some more "western friendly" choices. We do not have any clear favourite meal since one or another of us was often heard to say "this is the best meal yet!" All of our hotels were very good and we appreciate your choices. Our cruise on the Yantze River was memorable and the cabins were more than adequate. We had heard so many stories about very small and cramped Riverboat cabins that we were very pleasantly surprised by our accomodation. One comment we must make is that one of the group we travelled with left a very important back-pack with personal belongings and important documents, valuables and money in an airport restaurant. The back-pack was turned in at the airport lost-and-found with all of its contents intact. Your travel company and your staff helped her locate her bag and helped her to recover it. Thank you Tina Wang/Maggie Yee! Our last comment is that we found the tour was a very good value for the money spent. Janet and Stanley Jackson (from Canada). Content : I wanted to thank you for our wonderful trip. We were traveling with TCG from Oct. 23-Nov 6. We were a group of 6 and I am the lady who left her backpack in the Shanghai Airport. If it wasn't for your immediate response and efforts to locate the backpack I am sure it would have been lost forever. Instead we were able to retrieve it. So thank you TCG very, very much. Apart from that we cannot brag enough to our friends (and also anyone we met along the way in China) about your organization and how wonderful all your guides are. I have never been on a trip with a tour group that gave such outstanding service. All our guides: Brian, Annie, Peter, Janna and Julia were beyond professional, well informed and a joy to spend time with. Many Kudos to TCG our group gives you a 12 out of 10 and at least 10 stars *********!!! 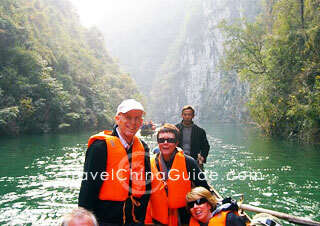 Rest assured that we will recommend you highly to anyone planning a trip to China.